Sister Beatrice Orient, CSJ, 84, died, Sunday, February 8, 2015, in Villa St. Joseph in her 67th year as a Sister of St. Joseph. 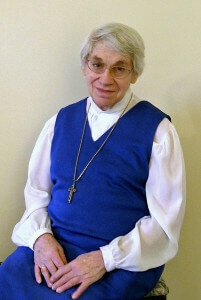 The daughter of John J. and Catherine S. West Orient, Sister Beatrice entered the Congregation from St. Agatha Parish, Bridgeville, PA.
For twenty years Sister ministered as a teacher in the Pittsburgh, Altoona/Johnstown, and Greensburg Dioceses, including seven years at Transfiguration in Monongahela, PA. Sister also served in the clerical department at Quigley High School, as a tutor at the Beaver County Rehab Center, and as an aide in the Motherhouse infirmary. From 1980 until the present Sister Beatrice volunteered in various ministries in the Motherhouse while faithfully visiting the elderly, and the sick and dying, including the residents of Villa St. Joseph. She was recently admitted to Villa St. Joseph due to declining health. Sister Beatrice will be remembered for her compassion, her readiness to help wherever needed, and her quiet acts of kindness that touched the lives of so many. She gently ministered in the manner of the humble, hidden St. Joseph. When she wasn’t caring for others, she could be found caring for and nurturing plant life both indoors and outdoors. Sister Beatrice is survived by nieces and nephews, grandnieces and grandnephews, and the Sisters of St. Joseph of Baden. Friends will be received Tuesday from 1-8 p.m. and Wednesday from 11:00 a.m. – 2:30 p.m. at the Motherhouse of the Sisters of St. Joseph. Mass of Christian Burial will be offered in the Motherhouse Chapel Wednesday at 3:00 p.m. Burial will follow in the Sisters’ Cemetery on the Motherhouse grounds. Donations in the name of Sister Beatrice may be sent to the Sisters of St. Joseph Memorial Fund, St. Joseph Convent, 1020 State Street, Baden, PA 15005. Make a donation in memory of Sister Beatrice.